We are delighted you are visiting us ‘online’ ~ please get to know us as you meander along! 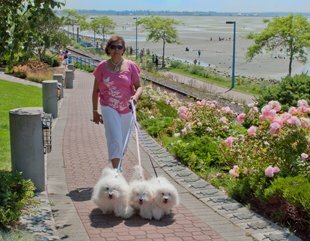 It was the Spring of 2008 and I was seated in the Parlor of my home in White Rock, ‘beautiful British Columbia’, gazing pensively through the windows when I saw a lady walking a dog – a breed I had never seen before. 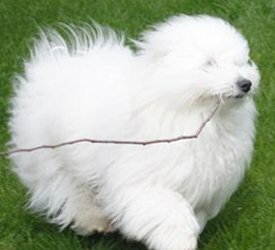 I quickly ran to the porch and called out to her … she very graciously came over and I asked what breed her dog was she said: “Coton de Tulear” and explained it was a very rare breed; she was visiting from out-of-town and “Yes!” the dog could travel on the airplane with you! I just fell in love with the breed and after she left quickly googled and read all about the breed and even spoke with a couple of breeders from out-of-town. I was ‘love struck’, however, quickly said to myself: “NO! I am still not ready for another dog, nor do I know if I want another dog.” as my beloved Cocker Spaniel of 13-1/2 years had died in December 2006 and she left a huge void in my life. This was one of a few big changes I was going through since January 2005 so I decided to wait. Little did I know that I would yield to my inner promptings and get my first Coton de Tulear puppy – a male – ‘KINTANA’ in May 2009; the second in March 2010; third in October 2010! Yes! I added 2 females to my family of White Pearls in one year: ‘JEWELA’ and ‘FATIANA’. It was such a pleasure to see my Coton family enjoy themselves all around my home – inside and outside in the gardens – life sure changed for me. my family and friends, the community(ies). organizations I support and … everywhere they go. You may contact me either by phone or email – it is my pleasure to be there to assist you.